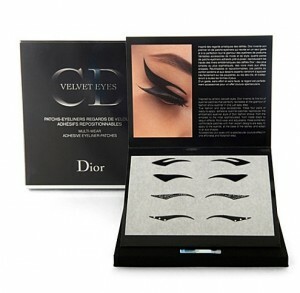 If you are not steady handed enough to create the perfect smooth winged eyeliner flick then fear not, Dior have created a beautiful set of eyeliner transfers which will be the answer to all of your prayers. This is such an innovative idea. We recently blogged about Violent Lips lip transfers, which is exciting but a little ‘off the wall’ for general use and not really everyone’s cup of tea! These transfers however, offer sophisticated glamour and a make-up look which will look like its been applied by a professional. There are four transfers to a pack, all different and unique in their own way, from a simple black matte design through to a Swarovski crystal embellished design for the ultimate statement. The patches are also apparently adjustable, so can fit snuggly to your unique eye shape and are also reusable (though it doesn’t say how many times they can be reused). However, obviously as with anything stamped with the Dior branding, you are paying for the luxury, and these transfers come with a whopping great price tag of £47 of your Great British Pounds. Hopefully this catwalk trend will be something that eventually filters down to the drug store beauty market, where we can sample the delights of eyeliner transfers at a far more affordable cost. For those of you who simply can’t wait, or if you wish to try the real mcoy, you can pick up Diors Backstage Eyeliner patches from Selfridges.